But don't chuck it down the hatch just yet - 27 are still shutting their doors every week. 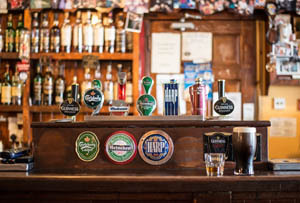 While the emergence of the gastropub and rise in popularity of craft beer have been credited with keeping the UK’s boozers alive a little longer, there’s been a well-documented uphill struggle to keep the pub industry pulling pints – for a number of reasons. So it’s understandable that any glimmer of good news is simultaneously seized upon by pub proponents. New figures by the Campaign for Real Ale (CAMRA), compiled by research firm CGA Strategy, said there were 52,750 UK pubs at the end of last year and the rate of decline had slowed to 27 pub closures a week in the second half of 2015 (compared with 29 in the six months before this). You may have to regard this news through beer goggles to view it in a particularly positive light, but CAMRA’s CEO Tim Page had a go. ‘The latest figures show that the work of campaigners across CAMRA, the wider pub and beer industry and the government is taking effect and arresting the decline in the number of pubs being lost every week,’ he said. In fairness, it was much better than 2009, which recorded a rate of closure of 45 a week. He did though, also point out that these figures were ‘a fragile recovery’, if you can call it that at all... Page warned that it could ‘very quickly be reversed if the government fails to build on this positive development and misses the chance to support the British pub and beer industry by reducing tax again’. A report from the Centre of Economics and Business Research last year said pubs would benefit from a cut in beer tax and that had it not been cut in 2014, beer would have increased by 16p a pint, more than 1,000 more pubs would have closed and an estimated 26,000 jobs wouldn’t have been created. There were some signs campaigners were making an impact. Closures of local community pubs specifically were down from 26 to 20 a week, which is about as positive news pub campaigners can expect. A wider commitment among local groups to get pubs listed as Assets of Community Value could gradually be paying off. That doesn’t go down well with everyone mind. The landlord at the Duke of Hamilton pub in Hampstead hit the headlines late last year when his pub was listed – he wasn’t best pleased that he had to notify his local council if he wants to sell the pub and give locals the chance to buy it if they can raise enough cash in six months. Steve Coxshall said all 800 campaigners would now be barred from the pub. ‘If you have a six-month window where you can’t sell it, who is going to pay the bills?,’ he argued. ‘They haven’t put any money into the pub – they are just a bunch of hypocrites in cardigans.’ Campaigners will be hoping his isn’t a widely held view – that’d really leave a bitter taste in the mouth. The slight fall in closures is a small piece of good news for pub-goers though – knitwear owners or not.